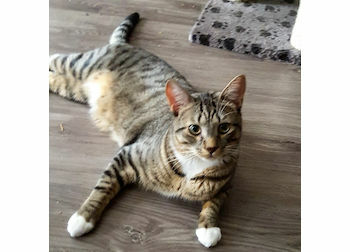 My cat ran away, Wednesday night April 5 on chemin Chambly, between Highway 30 and the restaurant Pocolina in St-Hubert (j3y 5k2). He’s a 1 1/2 year old male, who doesn’t go outside. IHet is fearful and afraid of noises, he is tabby in brown tones with a white tips on his paws and a white “v” crown on his neck. Next Post: Cachou – found!